A graphic that shows one way to overstate an argument -- go ahead, try to buy a machine gun and see how far you get. I’ve had a strong impulse these past few days to add my two cents on the Sandy Hook massacre and the subject of our gun culture that allows easy access to the mentally unstable, criminals, drunks, angry spouses, terrorists and more. Most that have written seem to focus on whether this horror could have been avoided. Since I’m not a “me too” kind of blogger, I hesitated. But in reading some of the arguments, one thing jumped out at me that I see through the eyes of someone trained to persuade: Many of those making arguments vastly overstated their case. And when you overstate your case, as any lawyer that’s argued in the well of the courtroom knows, you destroy your credibility with respect to other arguments. So let’s take two sample arguments related to Sandy Hook and gun control. First, there is the magnificent stupidity of Megen McArdle writing at the Daily Beast. She argues, in the face of clear evidence to the contrary, that there’s little we can do to present a future massacre. Given that no other industrialized nation in the world has as many guns and as many gun deaths, this is clearly false. In 2008, for example, we had over 12,000 gun deaths while Japan had 11. We obviously can do something; the question is whether we choose to do so. The more regulation we have over firearms and their owners, the more difficult it is for homicides of passion, mental instability, or money to take place. Fewer guns = fewer gun deaths. McArdle makes the vapid argument — made by others I might add — that laws won’t stop all gun deaths. She writes, “it’s unlikely that 100% of potential spree killers would be identified before they picked up a gun.” No kidding. But that ignores the societal benefits of reducing the number by 25%, by 50%, by 75%. Laws will never stop all crimes, but they can reduce them, and thereby reduce the number of innocent deaths each year. Here’s a clue to listening to an argument: When someone makes claims for all or nothing positions, they are usually building strawmen to easily knock down. Even if she had a legitimate point to make somewhere, her credibility is shot. I find my self continually amazed at those that think the answer to the gun problem is figuring out how to take down the guy after it’s already started, instead of making it difficult for him to get started in the first place. Now on to the other side. 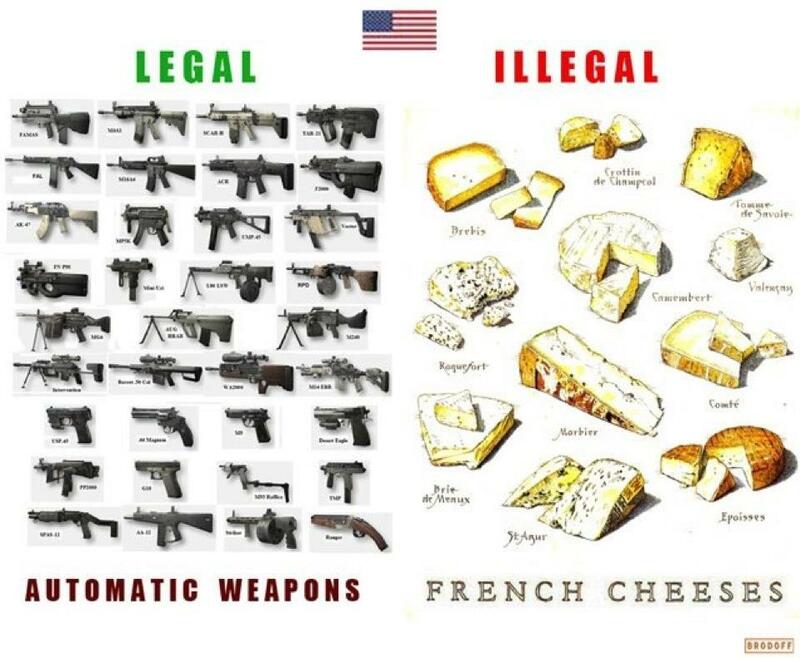 See that graphic on this page, showing the stupidity of laws that make machine guns legal while certain French cheeses are illegal? Dumb, dumb, dumb. Machine guns aren’t the problem because access to them is so highly restricted. $10 for the first gun and $6 per gun thereafter. Machine guns are $20 and include assistance in the range from one of our staff. With 20 small caskets going into the ground along with teachers, gun control advocates don’t need to overstate the case. They only need to set forth the facts — including the vast numbers of annual gun deaths in the U.S. — because the facts are horrible. If you want to persuade, don’t overstate. Don’t sacrifice your credibility, for if you do, the rest of your arguments won’t be persuasive. They won’t be persuasive because you’ve lost the audience.